A few years ago, my sister handed me a lumpy white envelope for Christmas. I opened it carefully, able to feel the jumble of small parts beneath my fingertips. 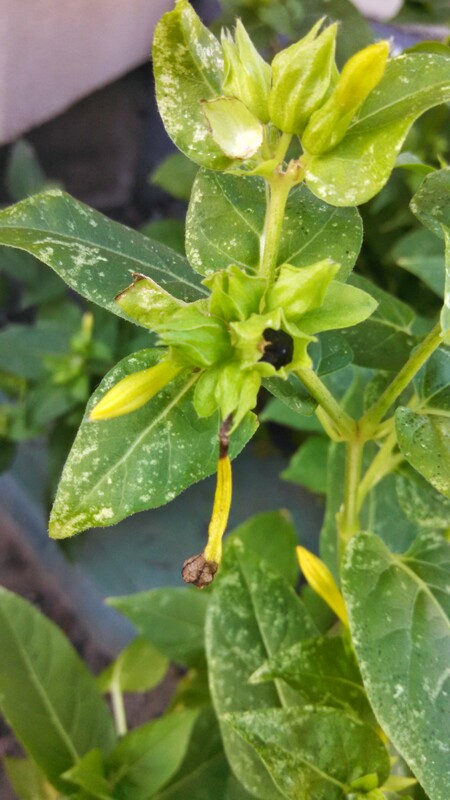 Inside were perhaps 30 or 40 small, dark seeds. I squished my sister in a big hug, tucked the envelope in a box of other presents and returned to the festivities, only to re-discover the white envelope while unpacking a week later. Such an odd present, I thought, as I shoved it in the back of the knife drawer in the kitchen for lack of a better place. Maybe the little things will grow and save me some money on flowers for the front planters. And then I promptly forgot them for six months. I found them when that drawer jammed. After yanking and jerking on the handle failed, I began wiggling the knives that I could see and poking them around through the small opening. When I finally slid open the drawer, I found black seeds rolling around. I searched my memory (after gingerly touching them to ascertain their constitution) and recalled the white envelope, Christmas and the flower seeds. I was planting flowers a few days later and tossed them in the ground beside my impatiens and forgot about them yet again. The flowers that grew are called 4 o’clocks. A dozen red roses on my anniversary or the scent of fresh lilacs on Mother’s Day are just what I want, and I have tried zinnias, hostas, impatiens and violas in my front planters. But these 4 o’clocks? They are my favorites. The bushy plants can grow waist high in warmer climates, and the burst of multicolored blooms in late summer is gorgeous. Oddly labelled as “annual/perennial,” the flowers are both because as they begin dying down in autumn, they form little black seeds; left to themselves, the seeds will drop to the ground and potentially plant themselves and begin growing in spring if conditions are hospitable. Not one to take chances, I like to pick the little seeds and dry them, then put them in a safe place for spring re-planting. The weather in Utah is not always favorable for the little football-shaped seeds; they can freeze or drown or dry out. At least, that’s what I tell myself. The real truth is that I adore the tedious job of picking twenty or thirty seeds every day or two. Absolutely love it. You might read those last words as sarcasm, but they are not; I find there is something delightful about peering intently at the bushes for glimpses of black, then plucking out the seed with my thumb and index finger. I stand barefoot in the cool green grass as night descends, picking and peering, peering and picking, focused solely on the minimalist task before me. It requires just enough attention to take all my attention, and that is a beautiful thing. No rambling “I should be doing” thoughts, no meandering “what about this or that” thoughts, just me, a few late-blooming 4 o’clocks, the light cool evening air, and a dozen black seeds cupped in the palm of my left hand. 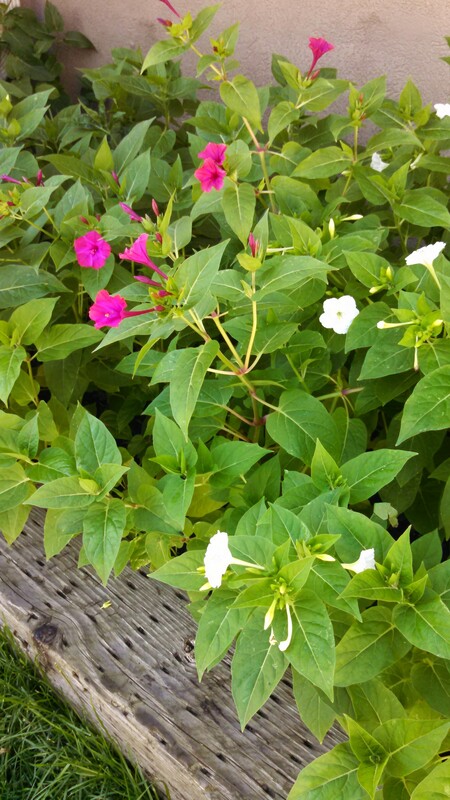 These are 4 o’clocks, my favorite flower. They were given to me by my sister, a lovely woman who understands how to save seeds during the cold months of winter and wait patiently for a new season, a growing season; she understands the delights of tedious work and the hazards of re-growth. She also knows why these flowers have such an unusual name. Unlike most garden-variety blooms, the 4 o’clock blossoms begin opening late in the afternoon and fully extend themselves during the coldest night hours, closing up humbly during the light of the day. Other flowers bloom in the clear and easy noonday, and I am happy they do. I delight in fragrant summertime flowers. But the flowers in my front planters bloom at night. I do not know how it works; I only know that this flower and some people become who they really are when the night is the darkest, when everyone else has long since gone to sleep. No one is there to lavish them with praise, and no one knows just how dark and cold the night really became, no one but them. When midnight presses and air turns bitingly cold, their response is beauty and openness, a glorious choice to fulfill the measure of their creation when no one is awake to measure; they bloom alone in the yellowish haze of the flickering streetlight. I merely wake up with the dawn and catch a morning glimpse of god-blessed beauty–bright pink, pure white, lemon yellow–before they close up. But I know–and all who know 4 o’clocks know–that they opened gracefully again last night. I have called my sister to thank her for my 4 o’clocks no less than a dozen times during the last few years. I thank her, she laughs, and then I laugh at my silliness, too. How many times should one thank her sister for a lumpy envelope of misjudged, almost-forgotten seeds? Is seventy times seven the appropriate number? It really was just a simple Christmas present. Nothing fancy, nothing extreme. But I find an intense satisfaction in joining the perennial process in my own small way: tending, weeding, watering and harvesting the seeds. I will plant them again next spring, and in late summer I will celebrate and be grateful for a small and delicate flower that blooms in darkness. Happy National Writing Day, by the way. Thank you. I appreciate you reading and responding. Goodness, such a beautiful post! If only we all could be so vulnerable to be our best when circumstances are the hardest and no praise is forthcoming. Thank you! Kylie! A beautiful post. You are a lovely wordsmith. I know exactly what you mean about the pure, pleasurable absorption of a gardening task that requires all of my attention. I would love the task of seed-harvesting, too, and would save it for an island of peace in a chaotic afternoon. Thanks for the post! Thank you. I remember hating gardening as a child (worst job of the week), but not anymore. Maybe I just didn’t need or appreciate such slow and serene things back then. Kylie! This was beautiful. I was just wondering yesterday how you were doing. I’ve enjoyed stumbling across your writing over the years since we were in the dorms together.